What an indie flick taught the Naval Diplomat’s alter ego and his sidekick about US-India ties. Last Friday Night, the Naval Diplomat went undercover as the Naval Hipster in order to blend in among the denizens of an exotic seaport named Providence Plantations. This was less of an identity switch than it might seem. Hipster garb resembles the costumes worn by the natives in equally strange lands bearing names like Somerville and Cambridge, former Naval Diplomat haunts. The goal of this foray: to take part in the annual Rhode Island International Film Festival. My trusty sidekick and I harbor a secret fetish for furrin films. The time had come to indulge it. The evening's offerings included two amusing "shorts" from Rhode Island School of Design students. 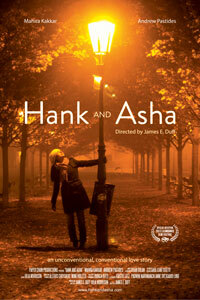 The shorts preceded the main feature, a new indie film titled Hank and Asha. There are advantages to having offbeat tastes. For one, you often get to meet the artists. That was the case with the film festival, where the director and producer were on hand for an impromptu Q&A afterward, and just to talk. Nifty. Anyway, the film consists entirely of video messages between the title characters, a son of the North Carolina hinterland trying to make a go of it as a filmmaker in New York City and a young Indian woman studying film at a school in Prague. It's mainly about their forming what the director calls a deep personal connection between two individuals, and it succeeds on that level. A romantic entanglement gradually develops from impersonal contact between filmmaker and student. Both Asha, who initiates the exchange, and Hank display an oddball sense of humor. Without saying too much, a couple of scenes elicit belly laughs. One involves a North Carolinian New Yorker's take on Bollywood. Speaking of which, there's an undercurrent of cultural commentary — not laid on too thick, thankfully — as they learn each other's folkways. Think about it. That's a heckuva lot of cultural interactions at work: U.S. v. India, American South v. Northeast, India v. Central Europe. One comes away from viewing the film with the (correct) sense that both India and the United States are bigger, more variegated, and ultimately more interesting places than people allow. What do Indians or Americans want? Which ones? Hank and Asha also confirms just how different India and the United States remain. You've heard the superficial comparisons: two English-speaking countries, the world's oldest and biggest democracies, natural strategic partners, you've heard 'em all. Posh. Getting to know each other is a project that could span generations. It's a project worth undertaking. The director promises a limited theatrical release over the next few months. Check it out should the opportunity arise. Four years after a historic nuclear deal was signed, many in American policy circles deride the agreement as a failure. They’re wrong.